By bringing together a diverse group of builders, designers, farmers, artists, craftsmen, and engineers who share a belief that collaboration and empathy lie at the core of all good work, the Mumbai based architecture practice Case Design creates moments of hospitality, social interaction, reflection, play, ritual, seclusion, performance, and comfort. Architecture seems to step back in order to orchestrate a careful balance of multiple operations that meet on a common project. When the Centenary year of the Bauhaus begins, we can to see here a new form of architectural Gesamtkunstwerk. Multidisciplinary influences–including education, art and craft–integrated in an economically viable construction advocates the true Bauhaus’ rationale. 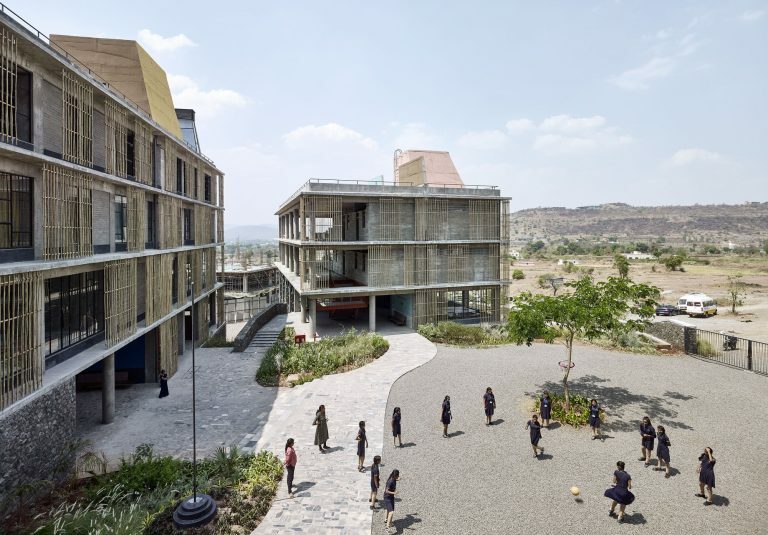 Settled into the valley slope above the small village of Lavale and still a work-in-process, Avasara Academy is a residential school for young women in India. The simple concrete structures that establish the built environment of the campus are designed for their economic efficiency as well as their flexibility and readiness to adapt. This rudimentary framework enables a process of dialogue allowing everyone to participate in the process of making this school. A collection of indoor and outdoor spaces intended for a variety of uses, the campus is designed to give a sense of familiarity and intimacy to the young women living and studying here. They are made in response to what is already there; climate, landscape, materials, routines, traditions and memory. Nurtured and adapted throughout the design and on the building site, these spaces have evolved with the influence, expertise, and enthusiasm of collaborators. The passive cooling system developed with climate engineer Pratik Raval prescribed exposed concrete ceilings and stone flooring to provide thermal mass. In response we worked with contractor Rameshwar Bhadhwa to create coloured stone mosaic flooring from waste material and visual artist Malene Bach developed a series of natural pigmented colours for all of the ceilings. Her colours transform each space but are also a response to the surrounding landscape, for which artists Teja Gavankar and Vishal Kadam developed a series of astronomical instruments which are simultaneously artistic elements and scientific apparatus for the campus. Mira Nakashima’s donation of a Table of Peace initiated the idea for a Peace Pavilion, set in the landscape as an intimate space for tranquility and introspection. The benches, showcases and other wooden elements were developed with a team of carpenters from Rajasthan. Together with the large photographs of the school captured at different moments by Ariel Huber, the exhibition shows how construction, landscape and craftsmanship are generated through rigorous practice, strong conviction and a process of inclusion.